The Mac had only been out for six months and already the fanboy trope was already in full effect. Jerry Pournelle holds a doctorate in psychology and is a science-fiction writer who also earns a comfortable living writing about computers present and future. I’ve just come back from COMDEX Winter in the Los Angeles Exposition Center, where I got to play with the new AT&T computers. When AT&T announced a computer line, there was a bit of panic on Wall Street; after the prices were announced, the excitement died away. Too expensive. Who’s worried about a computer line whose lowest-cost item is a $9950 desktop? How can that affect the micro world? That’s what many Wall Street analysts said, anyway. I don’t own any computer stock—the conflict of interest is obvious—but if 1 did, I’d give that analysis a lot of thought. People, that AT&T desktop computer is one hell of a machine. True: just now, as I saw it, with little application software, it’s not much of a threat to anyone; but give it time, and there’ll be a different story. The AT&T 3B2/300 desktop provides an awful lot of bang for the buck. If I seriously wanted into the software business, I’d buy a 3B2 development system and get to work polishing up my skills in the C programming language; and I’d expect to get rich from it. AT&T quotes a four-week delivery time on the 3B2/300. With half a megabyte of memory (plus 32K bytes of ROM [read-only memory] for bootstrapping and housekeeping), it costs $9950 “with standard industry discounts available.” What you get is the basic machine built around the WE 32000 microprocessor chip, one 5/14-inch floppy disk, a Quantum 10-megabyte hard disk, two RS-232C ports, the UNIX System V operating system extended with a number of popular UNIX utilities such as YALOE and YACC (Yet Another Line-Oriented Editor and Yet Another Compiler-Compiler), and the Vi editor from Berkeley UNIX. The WE 32000 chip is a true 32-bit microprocessor; it corresponds somewhat to the National Semiconductor 32032 or the Motorola 68020. It’s also capable of 8- and 16-bit operations. Moreover, AT&T is committed to heavy-duty silicon support of the system: at the moment, the WE 32000 system has an external memory-management unit (MMU) and other external support chips. The whole system is designed to interface with UNIX. AT&T plans in the future to combine the microprocessor, MMU, and other support into a single chip, thus increasing both speed and reliability; AT&T’s people say the new chips will be upward compatible with the present 32000 systems. As I write this, memory for the 3B2 is $2400 per megabyte. AT&T makes 256K-bit memory chips and bundles them in clusters to make 1-megabyte boards no larger than a paperback book. Alas, I didn’t think to photograph one of the boards next to one of my paperbacks to illustrate the point, but a megabyte contains about 166,000 English words: the AT&T memory board could hold all the words in one of my novels and have room to spare. You’d undoubtedly want a full megabyte of memory for a development system, and indeed, to handle full UNIX you’ll probably need two; so the base price for a real-world development system is more like $14,500. We’d also want to upgrade the disk to at least 40 megabytes: that’s $2000 more. Finally, AT&T will sell you a wonderful terminal with a bit-mapped screen and its own WE 32000 processor to run it; that’s an additional $5000, so our development system costs $22,000; hardly cheap. However: we now have all we need. For an additional $500 per user (less if we want to use less expensive terminals), we can add up to 15 more users. The system is full multitasking, multiuser UNIX: we can let each of our terminals run more than one job. I saw 20 simultaneous jobs running on the 3B2/300, and that didn’t seem to slow it down much. One of the strangest sights I ever saw was the AT&T “Death Star” logo on an IBM PC; but there it was. You can use the PC as a terminal for the 3B2/300. AT&T, in conjunction with Locus, a small but highly competent Santa Monica software house, has worked out the hardware and software to network the 3B2 with the PC. What we saw running at COMDEX used a 3-Com Ethernet board in the PC and the regular 3B2 Ethernet board; but the software will work just as well with Omninet or (at lower speed, of course) with a straight RS-232C connection. That means we could connect up a Corvus Concept or any other machine that supports Omninet; or, if we want to write the interface driver, any machine with an RS-232C interface. This gives the 3B2 a lot of flexibility. Even with all terminals and the networking and throwing in a good printer, we’re under $30,000 for a 10-user system with full UNIX. What I saw running on that 3B2 wasn’t any ordinary UNIX: this UNIX had windows and a mouse, and while it didn’t yet have icons, it had nearly all the capabilities you expect from Apple’s Lisa, only this was loaded down with multiple users and was still fast. Yet more: using that marvelous bit-mapped screen you can run programs under the debugger and see the program output in one window, the debugger in another, and the source code in a third—while having one or two other application programs running along in still more windows. The debugger lets you insert breakpoints, step the program along line by line through the source code, and get the contents of the registers; i.e., it offers all the features you’d expect from a good debugging utility. I’m told it’s an outgrowth of the BLIT windowing UNIX prototype, but it has a lot more capability. The debugging system takes advantage of the speed and power of the WE 32000 in the terminal. Windowing is managed about the way you’d expect, with pull-down menus and the ability to change window size and shape and shuffle the windows to put the one you like on top; all this is done with the mouse in much the same way that Wirth’s Modula-2 operating system works. I suppose I shouldn’t be surprised, since most of these concepts have previously appeared at the Xerox Palo Alto Research Center (PARC); the whole micro community owes Xerox a vote of thanks for acting as the software R&D center for the industry. I can’t imagine why Xerox doesn’t market some of the goodies that have been developed, instead of exporting them to competitors, but these discoveries sure helped us all. In any event, if there’s something more powerful than the 3B2/300 for software development at anything like the cost, I haven’t seen it. The 3B2/300 weighs about 30 pounds and is roughly the same size and shape as an IBM PC XT. Its innards are certainly no more complex than an XT’s. If the introductory quantity one price is $9950, what will the quantity one hundred price be a year from now? Ditto with memory: that $2400/megabyte is quantity one today; I expect it to fall by half within two years. Do They Know the territory? Every publication from computer magazines to the Wall Street journal has speculated that AT&T knows a lot about computers but not a lot about marketing. How could The Phone Company learn that? This is, after all, the hated Ma Bell .. .
“We seem to have done a good job of creating a demand for UNIX,” he said. Which is true enough. Moreover, I notice that even IBM is supporting UNIX, both directly and through Intel, which is developing UNIX for the Intel iAPX286 chip. Maybe some others, particularly if you count UNIX clones such as UNOS from Charles River Data Systems, thought 1. but I didn’t want to argue with him. There’s a lot to that. If some outside company had been supplying Ma Bell with office computers for accounting, billing, word processing, and all the mundane tasks one uses computers for, we’d think it a highly experienced company. AT&T has in fact been using a lot of its own equipment for years; it just didn’t show elsewhere. The company’s got more user-service experience than has usually been realized. Then I remembered where I was. I was sitting in a carpeted office that looked much. like an expensive executive suite. I’d reached it by going through expensively furnished lounge and reception areas. Of course; AT&T can afford lavish offices—except this wasn’t any lavish office. This was in a bay of the Los Angeles Exposition Center. AT&T not only had the largest exhibit area I’ve ever seen at any computer show: the company had taken an even larger area, closed it to the public, and lavishly furnished it for the convenience of dealers, executives, and the press. Out in the exhibit area were about 100—and I do not say this for exaggeration—young men and women in dark suits, the most neatly uniformed and well-groomed corps of show people in my memory. Many were extremely polite, with plenty of social skills, but they knew nothing whatever about computers. If throwing money—or people—at a problem will solve it, AT&T will never have any difficulties. Of course, that doesn’t often work- But then it began to sink in. Along with all the well-scrubbed young women in stockings and heels and pinstripe suits and little neckties, and the young men in similar plumage—in among those were mixed real working software engineers and even a sprinkling of true wizards from Bell Labs. As a matter of fact, it was easy to spot the real hackers: the programmers all read BYTE and knew exactly who I was, while the press-relations people had never heard of me but tried to pretend that they had. I don’t have to ask if Bell Labs understands transistors. For reasons too complicated to explain, I have framed on my wall a dollar bill signed by Dr. William Shockley: it’s a tiny part of the Nobel prize he received for inventing the transistor while he was at Bell Labs. The Phone Company never did lack for scientists and engineers. AT&T won’t have problems in that department. This is one of the few companies that plan for decades ahead. If That’s Not Enough AT&T also has some brilliant management, beginning with Jack Scanlon, who understands this business pretty darned well. We sat in a lavish office suite surrounded by the trappings of corporate power: but Scanlon talks like any true hacker. He reminded me of a lot of the sharper micro people I know: there was that same breadth of knowledge about the field, familiarity with every intimate detail of his own product, obvious pride in the company’s achievements. And more. On software and computer languages: “Language is the wrong way to look at it. Move back a few steps. Watch that guy at his desk. What does he want the machine to do? He knows he can do more than one thing at a time. He has to worry about a lot of things at once. What I want is fundamental building blocks he can throw together fast. This guy wants spelling and maybe a spreadsheet, another fellow needs a database. Once we know the concepts, we don’t have to worry about languages. We can even put them in silicon. That sounds a lot like marketing smarts to me. Sure: AT&T will make marketing mistakes. The people there are used to figuring out what they think people need and providing it whether it’s wanted or not. It will take considerable effort to modify that attitude. Consider: here AT&T spent more than I’ve ever seen any company spend at any computer show: this to bring products to a dinky little COMDEX that I wouldn’t have bothered to go across town to see if AT&T hadn’t been there. The press corps was the smallest for any show I’ve been to since the 70s. Having brought the 3B2 to the tiniest pond available, AT&T still didn’t have a good mechanism for getting people to a press conference. The COMDEX staff were even telling people it had been canceled: if I didn’t have a nasty, suspicious nature so that I checked with AT&T myself, I’d have missed it. just before COMDEX, I received three phone calls, two letters, and a telegram reminding me that I could have an interview with John Scanlon. When I discovered I was missing the press conference—it was in the Bonaventure Hotel, a mile from the show—an AT&T expediting officer put me in a cab to get me there. AT&T sure paid attention to press relations: but with what result? 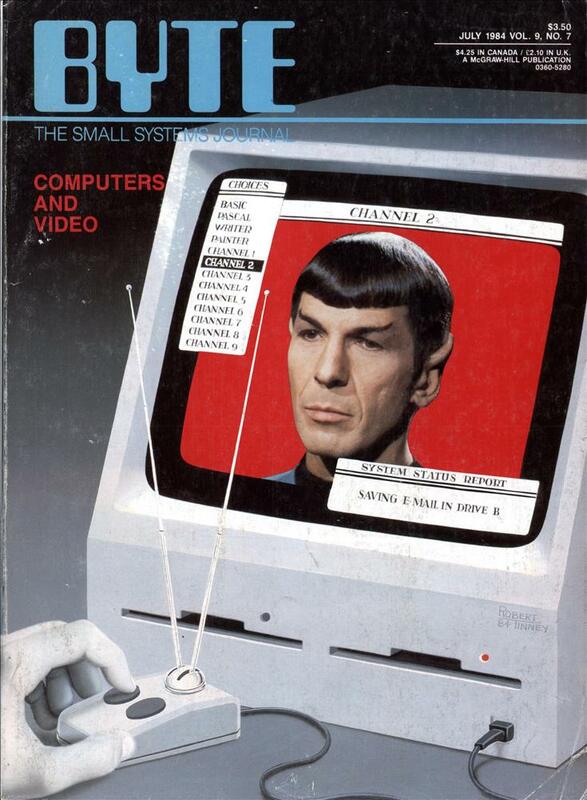 Apple spent far less to get Macintosh on the cover of every magazine in the country. I’ve yet to see real coverage of the AT&T market entry. Maybe: but that 3B2 is one heck of a machine. It’s state of the art, and it’s available now. Of course, it’s not a retail system. AT&T intends just now to sell to system developers and value adders who’ll package it into full systems that will inevitably cost quite a lot. Retailers needn’t worry just yet. However: where else can you get a UNIX development system that you can also use for your general-purpose computing at that price? And certainly The Phone Company knows how to build rugged, reliable equipment. 1 wonder what the 3B2/300 will cost next year? Of course, we haven’t heard the last from the micro world either. AT&T’s machines are still positioned for maximum effect in the minicomputer world, and if AT&T has a year of development time to impact micros, so do first-class microcomputer outfits like Sage and CompuPro. The race isn’t anywhere near decided. Whatever happens, the micro industry had better think hard about AT&T’s impact, which will be as big as IBM’s. AT&T is big, is here to stay—and has got some damned impressive machinery. Update: AT&T has also got some real marketing problems. It took me two days to find out the licensing fees for UNIX System V on 68000 systems, and when I finally did, I found the fee structure is set for minicomputers: the company doesn’t know how to handle thousands of sales. In fact, I found myself conducting a telephone seminar on the micro market. Maybe the people there learned something. More next time. I’ve been sitting here bringing up Mac-Write, and while swapping disks back and forth on my Macintosh, I thought about the contrast with the AT&T system and UNIX. It takes a couple of minutes to get the Macintosh ready to run a simple text editor: for me that’s far too big a waste of time, especially when the only editor available is MacWrite. In other words: I’m nowhere near as impressed with the Macintosh as everyone else seems to be. 1 know I’m in trouble for saying that. I’ve already experienced what happens when one is less than enthusiastic about Macintosh: the Mactribesmen descend in force with fire and sword. You must overlook all the Mac’s faults, for after all, they’re only temporary. Everything will be fixed . . . If IBM or AT&T had come out with a machine that had a single disk drive, no Control or Escape keys, nonstandard interface between keyboard and system, proprietary operating system, limited memory, closed architecture with no possible access to the machine’s innards, disk formats totally incompatible with anything else in the micro community, no languages except Microsoft BASIC (and plenty of bugs in that), and absolutely no application software, the micro community would have screamed bloody murder. Apple has done precisely that, and everyone applauds. I’m sorry, but I don’t. As I write this, the Macintosh is a wonderful toy: but it’s not very much more. Now, it certainly is fascinating. I know no one who has a Mac who wants to sell it. When it was my turn with the Mac that Dr. Hyson and I own between us, he parted with it reluctantly, and I can certainly see why. The machine is fun. It just isn’t very useful because there’s no application software. Indeed, there’s less than we thought, because Microsoft’s Multiplan, which we bought with the Mac, is no longer being delivered; the dealers have just been told to take it off the shelf. We have not yet been told why or what Microsoft will do about our copy (which we paid full retail for. as we did with the Mac itself). The Creator In fact, the only application software for Mac that’s actually on the market is Bruce Tonkin’s The Creator database. The Creator is a kind of personal filing system, and there are versions for nearly every microcomputer I know of. The data files created by it can be transferred among all these systems-except. of course, for the Macintosh, which sits in lonely isolation. For the price—$35 postpaid, 30-day money-back guarantee—The Creator is one of the best values in micro land. I recommend it for nearly any machine; but especially for the Macintosh, since it lets you do something useful with the machine. The Macintosh version of The Creator is written in Microsoft BASIC. It doesn’t use the Macmouse, because MacMicrosoftBASIC is too full of bugs to allow that. Instead, Bruce takes all input from the keyboard and formats it himself; of necessity, he has to treat the Mac as a glass Teletype, ignoring all its splendid Macfeatures such as Quickdraw, because there’s no way to get at them. Tonkin writes many of his programs in his PBASIC, which is a preprocessor for Microsoft BASIC that works somewhat as the RATFOR precompiler works for standard FORTRAN. PBASIC lets you do structured code and handles most of the housekeeping for you. I’ve reviewed it before, and I still recommend it; Bruce has written some impressive software in PBASIC. The output of the PBASIC “compiler” is legal Microsoft BASIC; you can then truly compile that with Microsoft’s BASCOM to get tight, fast code that’s very portable. Alas, though, it won’t work on the Macintosh, because MacWrite won’t let you build large enough source-code files to make it worth porting PBASIC over to the Mac. I’ve lived in Hollywood for some years, and I’ve grown familiar with the typical Tinseltown deal. A producer goes to a star and says: “I’ve got a great script and your favorite director. Sure would like to have you in the picture.” Then he goes to the director. “I’ve got a star and a script, and the star sure wants you— Then to the writer; and finally to the money people. When it’s all finished, everything he’s said is retroactively true. Similarly: Macintosh is going to sell like hotcakes because of all that wonderful application software. Now you can’t do much with software on the Mac, because there’s too little memory, and it takes anywhere from 5 to as many as 40 disk swaps to copy a Macdisk; but it’s all right, because there will be a second disk drive, and a hard disk, and other excellent hardware after-market add-ons to fit on the Mac’s “virtual slot”: and after that the software will be easy to write. Software houses are going to work very hard to write application software for the Mac because there’s such a huge market, since Apple’s selling an awful lot of Macs. Hardware houses will do Macadd-ons because there’s so much software. Etc. It can certainly be made into retroactive truth. By the time this comes out, I expect it will be. Some of those Hollywood deals fall flat, though: it all depends on how quickly they can be put together before everyone in the industry catches on. Meanwhile, right now the Mac is mostly useful for people with special requirements, such as advertising layouts with text or producing memos with graphics. It sure is fun, though. Cataloging For some years now I’ve used Ward Christensen’s public-domain disk-catalog program. Lately, though, I’ve been importuned to try a new one called Eureka! from Mendocino Software. Eureka! has a number of advantages, including the capability to include lots of comments in your disk catalog. so that you can figure out that “NASTYLET.TXT” was sent to your mother-in-law rather than your lawyer, or whatever. It also lets you date things. Until recently, though, I couldn’t get Eureka! to work with my big CompuPro System 8/16, nor would it catalog the system’s hard disk. The Mendocino people kept trying, though, and eventually sent their stuff to Tony Pietsch; and as of an hour ago Noor Singh delivered a copy with the note that this time it works. It’s about time I changed over, and the ability to add comments and dates makes Eureka! nearly irresistible. Full discussion next month, or Real Soon Now if too much flows into Chaos Manor in the next few weeks; meanwhile, Mendocino Software deserves some applause for plugging away until their people could make Eureka! work on my system. Thanks. RAM Disk for the Z-100 Some weeks ago I got a letter from David lames at the University of Kansas. Zenith offered the faculty and students at UK one of those deals you can’t refuse, a Z-100 at a really good price, and Mr. lames bought one with a lot of memory. When he went looking for a RAM-disk program, though, he couldn’t find one. I had my assistants send copies of his letter to half a dozen places known for their RAM disks. We got only two answers. Zenith recommends Standard Data of Fort Lauderdale, Florida. I’ve not used this company’s boards, which come in 256K-byte sizes, but I suppose the hardware and software must work or Zenith’s people wouldn’t have sent me Standard’s address in reply to my inquiry. I’d suppose that CompuPro’s M-Drive/ H boards could be made to work, since they’re IEEE-696 (S-100) standard; but I’ve never heard of an installation program that would get M-Drive/H running under Z-DOS. Someone would have to hack up a BIOS (basic input/output system) for that, and I don’t know of anyone who’s done it. One other source I know of is Macro-tech out in the San Fernando Valley, which has a full 1-megabyte board for the Z-100. It’s been going for six months now with RAM-disk software. Late addition: we have one. it works fine. More next month. Eat Your Heart Out Macrotech had an impressive board running at COMDEX Winter: an 8-bit Z80 coupled with an Intel iAPX286 chip for 16-/32-bit processing. It was installed in a CompuPro boat-anchor box much like mine. I admitted that I was impressed. To make sure there were no misunderstandings, Macrotech’s people opened the box to show me that the board was wire-wrapped: a production model will be available sometime this summer or fall. The rest of the boards in the box were CompuPro. They claim that sometime before next fall’s COMDEX they’ll come over here, open my Dual Processor, remove the CompuPro 8085/8088 board, and insert a Macrotech board: after which my system will continue to operate on CP/M-8/16 as before, except that it will be faster, will be able to run Z80 as well as 8080 software, and will accept iAPX286 commands. We’ll see: my CP/M-8/16 isn’t the common variety, since Tony Pietsch did some work with the command processor, and enabled interrupts, and generally did a spit-and-polish job. On the other hand, I never throw anything away: I can certainly boot up the old standard CP/M-8/16 if 1 have to. Printer Optimizer Last month 1 mentioned Applied Creative Technology’s-Printer Optimizer, which is a box full of memory that sits between the Golem (CompuPro 8/16) and the NEC 7710 Spinwriter. Shortly after that, ACT recalled the machine in order to add even more memory to it. And I discovered that I was hooked. No sooner was the little jewel gone than 1 missed it terribly. It’s amazing how you can get used to the idea that printing is something that happens nearly instantaneously (well, at 9600 bps, which is the speed at which the computer ships data into the Optimizer). Waiting for the machine to print at normal speed (1200 bps) was just no fun at all. Ten days later it came back. The first time it showed up I’d had Alex install it. but he wouldn’t be back from UCSD for a couple of days, and I wanted the Optimizer now: so I tackled the installation myself. I am no hardware genius. Like most Americans of my generation, I learned to solder and install electrical switches and such, but when I was in school electronics meant vacuum tubes and hookup wire: not only didn’t we have transistors. but printed-circuit boards were pretty rare. Thus, while I’m not afraid of the innards of my computers, I do tend to think of hardware jobs with a distinct sense of unease, not to say dismay. There was nothing for it, though: if I wanted my Optimizer—and I sure did—I was going to have to do it myself. It turned out to be simple. Not as simple as it would have been had I wanted to connect it to a Centronics parallel port instead of through an RS-232C serial port, but simple enough. The ACT instructions are quite clear, with plenty of diagrams and examples and a good explanation of the theory of what’s going on. It took me considerably less than an hour to hook things up, and mirabile dictu, everything worked first time. Now, with 256K bytes of memory in the Optimizer, I can pack a great part of an entire novel into it. 1 can do that as one long file, or as a series of linked files, or even one file at a time if I want to fiddle with the last part while the beginning is printing out. The Optimizer even has a way to program it so that the files aren’t necessarily printed in the order you put them in: there’s a way to shunt stuff off, as on a railway siding, so that something else can be printed first. It’s not a feature I use very often, but it can be convenient, as for example when you don’t have the fanfold tractor on because you want to print single sheets, but there’s a convenient opportunity to load in a file that will need fanfold. If you don’t have a printer buffer, you don’t know what you’re missing. They come in a variety of styles with various features, and I haven’t much experience with any of them except the ACT Optimizer. I sure love this one, and it’s hard to imagine one easier to use. Given the wide variety of protocols and stop bits and other such stuff (the RS-232C meaning Revised Standard-232C, is anything but standard: there are a bewildering complexity of ways to hook serial ports to computers), it would be difficult to write better hookup instructions. Speeding Up Your PC Another gadget I’d just got installed last month was the Quickon from Security Micro Systems. This little gizmo installs rather simply in your IBM PC: when it’s all aboard, all you’ll see is a small switch on the back. Throw the switch one way, and the PC behaves normally. Throw it the other way, and the memory tests are disabled: the PC comes on nearly instantly. Now, I don’t think you ought permanently to disable the memory tests: but I sure don’t much care to wait for all that every time I have to turn the PC off to escape from some hang-up—and with no true hardware reset on the machine, that happens more often than I like. We’ve had the Quickon working for five weeks now, with zero trouble: and Jim Baen reports that he’s had his almost a year. If you like waiting for the PC, you won’t need this, but if you’re as impatient as I am you’ll find it nearly indispensable. Disk Maker New Generation Systems is a public benefactor. Our Kaypro 4 will, courtesy of a program called Uniform—itself a lifesaver— read a number of 514-inch disk formats, but there are machines it has never heard of. However, when we get a disk that the Kaypro can’t read, we no longer despair: we take it to the Disk Maker I.
I first heard about the Disk Maker at CP/M East when I stopped to talk with Leor Zolman. Leor was, naturally, demonstrating BDS C, the blindingly fast 8-bit C compiler he wrote while he was still an undergraduate at MIT but he’d been so impressed by the Disk Maker that, although he owned no part of the company that makes it, he had one to show off at his BDS booth. That was a pretty good recommendation by itself. 1 have considerable confidence in Leor’s judgment. He introduced me to the box’s inventor, and we arranged to get one shipped to Chaos Manor. The result has been as advertised. Disk Maker can read almost any conceivable 5-1/4-inch disk format. The machine consists of one or two disk drives—mine has two, one 48 tracks per inch (tpi) like the IBM PC, the other 96 tpi like the Eagle 1600 series—and an S-100-bus disk-controller card. You can install the Disk Maker card in your S-100 system and forget it’s there until you need it; then, when you get a disk with a strange format, fire up the Disk Maker. Chances are very good that it will be able to read it, and you can use PIP to move files to and from your normal system’s disks. We have the Disk Maker installed in Zorro, the Zenith Z-100. who also runs 8-inch disks in addition to his normal 5-1/4-inch disks; thus, we can move files from any 5-1/4-inch format to 8-inch IBM standard, after which they can be brought in for Zeke and the Golem. The Disk Maker will format disks, too; about 50 formats are supported. It’s thus nearly ideal for a small software house that tries to support a wide spectrum of customers. It’s easy to install, easy to use, and darned near unique. If you need one, you need it bad. Raving About Calendar/i Peter Flynn, our new assistant, sees a lot of software; alas, more than I do, since so much flows through Chaos Manor that I have to let Peter and Alex screen it unless it’s something I’m particularly interested in. Thus, he doesn’t give many rave reviews. Here’s one item he liked a lot. “Calendar/1 puts date-related information into a calendar format. It is easy to use. The manual is good and organized in a straightforward manner. The preface states that the manual assumes you know how to use the various CP/M functions such as PIP and COPY and that you have and can use a text editor that can produce plain text files ‘with no embedded control characters.’ “The text editor is used to create one or more files that are the sources for the date-related information. This is the best approach 1 have ever seen for a calendar program; it is easy to input large numbers of notices, and it’s very easy to update and modify into different calendars. This is by far the most useful and versatile program of its type I have ever seen. It is much better than the scheduler in Valdocs. “Calendars are composed of notices that are stored in calendar files. Each calendar file is composed of dates followed by notices pertaining to that date. The calendar files, which you create on a word processor, look like this: %This is a comment. @ 8/10/84 Meeting with Fred at 7:15 AM 7/29 First Moon Landing. 1969 8/10 Sally’s Birthday “The order of the dates does not matter, and you can enter the same date more than once. They can be organized under headings such as birthdays, meetings, notices, and social events. Under each date is a notice or group of notices. They will be printed in the box for the corresponding date on the calendar. Lines beginning with % are comments and are ignored by the Calendar/ 1 program. “A new calendar file can be for a month, a year, or many years. If a date ends in a year, such as 5/16/84, then it will be printed only in that year; if only a month and day are given, it prints the notice for every year. (Years can range between 1583 and 9999; if only two digits are given, the twentieth century is presumed.) “Calendar files can be separated or combined: you can have a file of birthdays and another of meetings, print a calendar for each, and combine those with others to make one master calendar. Calendar/1 comes with a number of prewritten calendar files, including holidays and historical dates of interest. “Calendars can be printed on screen or the printer. You specify the length and width. If a notice won’t fit, what will fit is printed, an asterisk is added, and the balance is printed as a note on an overflow page. The layout’s good considering the space you have to work with. “There are a number of other control features, all well documented. We expect to make a lot of use of Calendar/1 here at Chaos Manor. It’s a well-conceived and useful program. There’s a ton of stuff on my list, and I’m out of space. At least let me mention the Infocom games, such as Sorcerer and Enchanter and the like. Not only do we at Chaos Manor love them, but I notice that my partner Larry Niven is hooked. For those few who don’t know, Infocom games are script driven: there’s no fancy graphics, no arcade action; only text adventures. This kind of game grew out of the original Crowther and Woods Adventure of the Colossal Cave. The original Infocom implementers worked on Zork while at MIT they later developed other software for role-playing games. Some of the work they’ve done parsing and interpreting English is remarkable. I think that was a hint. In my judgment, Sage computers have about the same place in the world of the Motorola 68000 and follow-ons that CompuPro’s boat anchor has in the Intel 8086 and beyond world: they’re very probably the best systems you can get for software development; they certainly have a lot of bang for the buck. The Sage is also useful as a general-purpose computer: there’s getting to be a lot of good software, including engineering applications stuff, for 68000 systems. Sage uses a number of Sage computers internally for everything from accounting to new systems design; and therein hangs a tale. design. I also saw the oddest computer I’ve ever seen in my life. I mean. I’ve seen plenty of desktop computers, but I never saw one bolted to the side of a desk before; yet there was a perfectly good Sage II in that situation (see photo 2). It was running, too. None of the Sage crew seemed to think that was odd at all. They were used to it. Finally, I had to ask. It turns out that in the early days of Sage, when they first began to ship machines, they got more orders than they could fill; so that whenever Bob Needham, one of the cofounders (with Rod Coleman), would get a machine to help him with advanced system design, someone would see it and ship it off to a paying customer. Eventually Bob decided that enough was enough and bolted a new Sage II, sans case and fan. onto the side of his desk. The disk drives and power supply were in a drawer. I loved Jerry Pournelle’s articles in Byte. The 3B2 was truly ahead of it’s time. I saw one in person about 15 years ago, set up on someone’s computer desk. It’s an impressive looking system in person. I first started running Linux in 1993-1994 timeframe on a 386sx-16 (with 40MB RLL hard disk and 4MB of RAM). Then a bit later a 386sx-33 with 8MB. People were still running 3B2s, and furthermore since most of the GNU software that Linux ran (and runs) is free and open source, they were compiling and running the exact same software I was running on the 386 (i.e. 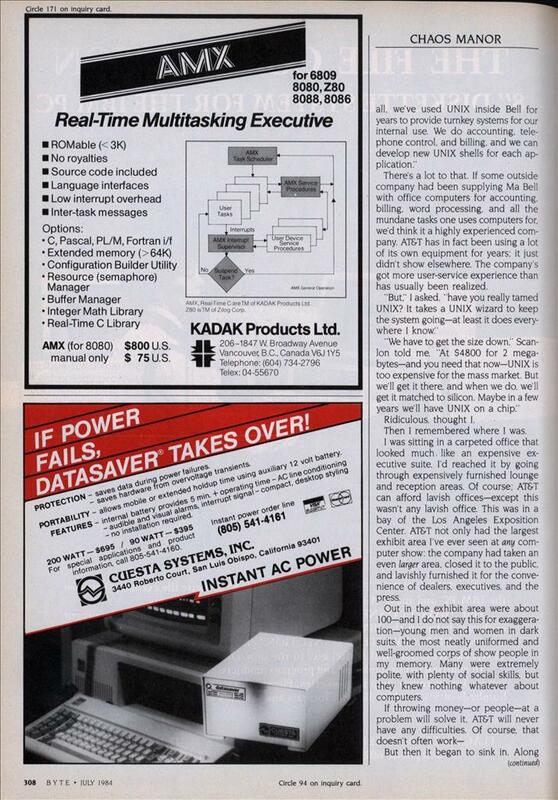 they weren’t just “stuck in time” running the early 1980s-era software they shipped with.) Really GUI utilities are right out (even on the 386, I needed at least 8MB to do anything beyond an xterm and xclock…) but even the present-day command line utilities are not that big.